HOUSTON (AP) It isn’t very often that Alex Bregman whiffs on two straight fastballs, so when he did so in the ninth inning on Wednesday it left Houston’s third baseman a bit upset. 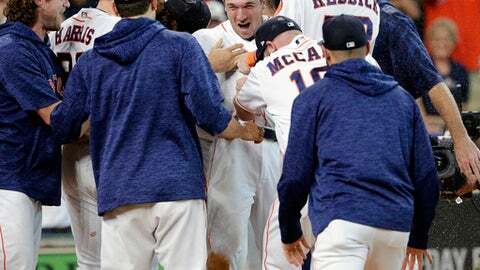 ”For him to be able to stay calm in the moment, we’ve seen this – Alex Bregman, game on the line, ice in his veins,” Hinch said. ”I don’t know how many hits Bregman had this series but he had too many,” Toronto manager John Gibbons said. After the Blue Jays took a 5-0 lead in the first, Houston scored three in the bottom of the first to close the gap and got within one Evan Gattis‘ RBI double in the fifth. But Kevin Pillar singled and scored on an error in the sixth to make it 6-4. Another RBI single, this one on a grounder by Aledmys Diaz, pushed the lead to 4-0 before Luke Maile’s sacrifice fly made it 5-0. Toronto starter Marco Estrada allowed seven hits and four runs – three earned – in five innings. Keuchel, the 2015 AL Cy Young Award winner who hadn’t allowed an earned run in his past two starts, gave up seven hits and six runs in 5 1/3 innings. ”Just a tremendous job of staying the course. Not getting too mad at himself. Not getting too frustrated and just putting up zeros to allow us to make it a game,” Hinch said. Astros: SS Carlos Correa sat out for the second straight day with a sore back. Hinch said the problem isn’t serious but he wants to give him time to rest. … RHP Joe Smith (right elbow inflammation) threw a bullpen on Wednesday and will likely begin a rehabilitation assignment this weekend. Gibbons managed his 1,500th game on Wednesday. He’s managed the second-most games in Blue Jays history behind the 1,764 games that Cito Gaston managed. He is 757-743 in his career, which leaves him in 11th place for wins among active managers. Gibbons, who is in his second stint as Toronto’s manager, has been at the helm since 2013.